OCNA Blog notes: CrazyCritter1966 accepts the permanent co-host position! And the OCNA blogger emails in a little Geocaching adventure, which is read early in the show. Hikerjamz After-Cache is an internet radio show on Spreaker.com. We discuss geocaching stories that you, the listener, send in about your favorite geocaching adventure of the week. Listen in to find out how you can contact us with your favorite stories and finds with your Host: James (Hikerjamz) From Ohio, USA. Here is the link to send a voice message: https://www.speakpipe.com/hikerjamz. sponsored by cacheface.social http://www.cacheface.social. Update, March, 2015: The W.B. 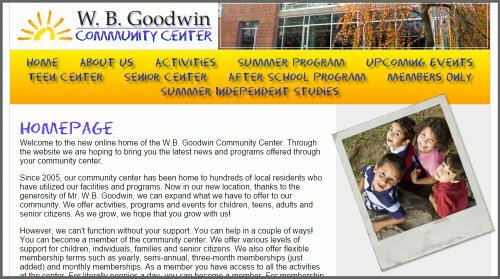 Goodwin Community Center removed itself from the internet about 3 months after this blog post, and about 5 1/2 months after a similar blog post on the topic by fellow blogger Ryan Ozawa. However, webmasters still need to be on the lookout for “spam for the children” scams; another example of which is detailed in this post. The W.B. Goodwin Community Center does not exist. Their website, a screen shot of which is shown here, is a front for a seedy internet link building scamming/spamming operation. They contacted us via our website contact email address in August, and duped us into posting a link on our links page to an unnamed Geocaching information page on a .co.uk domain. 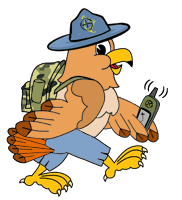 Then just yesterday, we received a request to post another Geocaching related link hosted on the same domain, and we knew something was amiss. This post obviously has little to do with Geocaching, but we’re hoping it will be indexed highly by search engines, and other webmasters will see it when they search for more information on this “W.B. Goodwin Community Center”. It’s a pretty interesting story though, so why not read on? 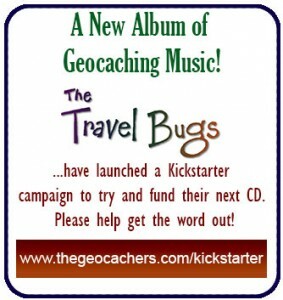 We’ve interviewed the creators of two current Geocaching related Kickstarter campaigns here on the OCNA Blog in October, 2014. Most recently was Steve, the man behind The Travel Bugs band, and their campaign for their proposed new album of Geocaching related songs “Pimp Your Cache“, on October 16th. Clicking on the image will take you to their campaign page. As of the date of this post, Halloween night, they are only 7% funded with 13 days to go in the campaign. Can you help them out? They could really use it. It’s a very worthy project, and as those of you familiar with Kickstarter campaigns know, they will not receive any of the pledged funds if their goal is not met. The GoCache Geocaching Card Game, which we blogged about one week earlier on October 9th, has been extremely successful; it was funded the first day, as you can see by this little badge they earned for their project page from kicktraq.com. This project is currently 281% funded with 8 days to go. They have also reached 4 of their 5 so called stretch goals (which we didn’t cover in our interview with them). These are basically “upgrades” on their finished manufactured product; for example, when the 100 backers goal was reached, all GoCache games were upgraded to high quality linen cards. There is still time to help them reach their final stretch goal! So we here at the OCNA blog would like to end the month by saying best of luck to Steve and The Travel Bugs on their Pimp Your Cache project, and congratulations to Tortoise and Hare Creations on their GoCache project. Please consider giving both of these projects another look while they’re still active, especially the Pimp Your Cache album by the Travel Bugs.